The College Hotel - Sleep in a cleaner, deeper and healthier way. At the beginning of 2016 a comprehensive restyling of The College Hotel was completed. The stately mansion’s interior, built in 1894, in the same style as the Rijksmuseum, underwent an elegant update. And The College Hotel also got a brand new event hall, The Rembrandt Ballroom. The warm and chique allure The College Hotel is known for was preserved. The building has many small recesses. They provide it with atmosphere. The styl is neogothic and neorenaissance, the most famous example of which is the Rijksmuseum. The bricks in the walls of The College Hotel are most likely to have been made by the same manufacturer that supplied those of the Rijksmuseum. 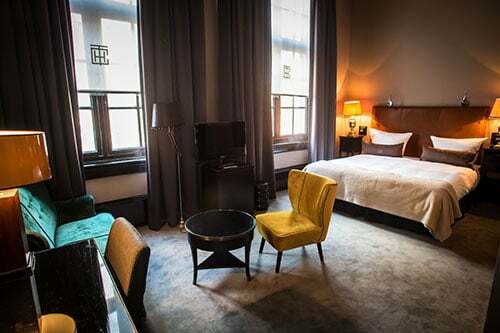 The historical atmosphere of The College Hotel is a combination of respect for authenticity and state-of-the-art design. The high ceilings, large fireplaces and spacious staircases are combined to create a very special ambiance indeed. Some years ago, the hotel was awarded the Prix Villegiature prize. The hotel’s named “The College Hotel” for its past as a school building, but also because forty percent of the staff is student. This was always the case, but is now actively communicated. They are being guided and trained in the daily practice of the vibrant hotel life. In doing so, they work under the watchful eye of experienced teachers and hotel professionals. Because of The College Hotel’s exceptional concept, the beautiful design and the pleasant service, (famous) guests from in- and outside the country love to stay here. Now you too have the opportunity to, in The College Hotel, experience what it’s like to awake entirely refreshed, making your day’s start a fresh and energetic one. You sleep in a cleaner, deeper and healthier way in a Junior Suite fitted with FreshBed. This stylish suite guarantees the ultimate sleep experience; it is fitted with all possible luxury and comfort, and the FreshBed is part of that. A fresh and clean bed with built-in temperature control, for an optimal night’s rest. 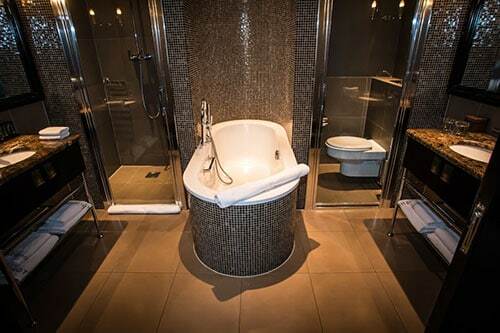 The suite is luxuriously arranged with elegant details and a luxurious bathroom fitted with a walk-in rain shower and/or a large bath. A comfortable bathrobe and slippers will be ready for you on arrival. A suite fitted with FreshBed can only be booked by telephone, with The College Hotel at: +31 (0) 20 571 15 11 .